Our exclusive Bittersweet Breakups tops make great gifts for friends or retail therapy for yourself! You can’t buy these anywhere else! 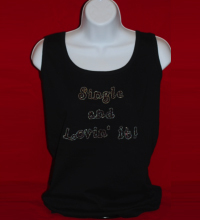 (We carry Women’s sizes Small, Medium, Large and X-Large and Misses sizes Small, Medium and Large. When you finally hit phase 3….YES you are SINGLE and YES you are LOVIN’ it! S, M, L in all styles. Last "custom" shirt needs field to add name up to 10 characters.